Freedom of speech in the United States is the right of individuals, groups, and communities to express their opinions without fear of reprisals, censorship, sanctions, or any form of retaliation. It is part of the over-arching freedom of expression that includes the reception, production and dissemination of ideas and information through various media forms. 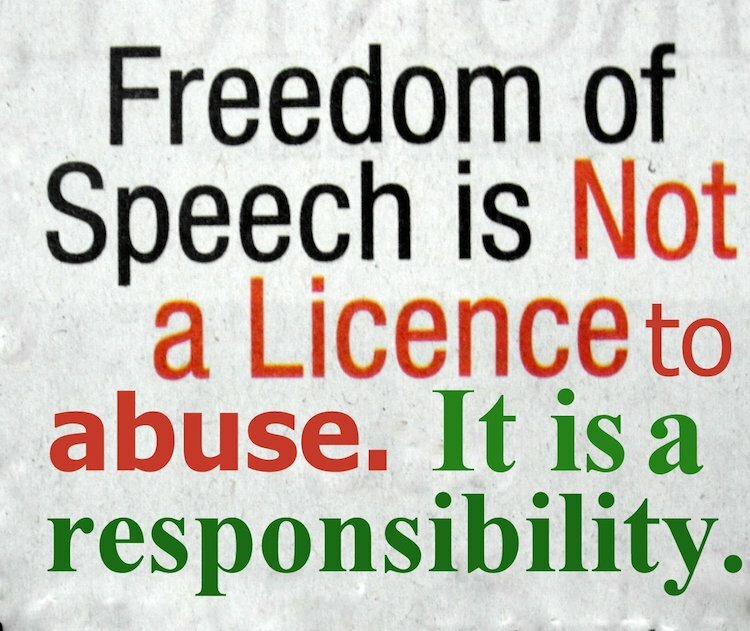 The United States is not alone in supporting freedom of expression: it has affirmation in the Universal Declaration of Human Rights (UDHR) document that was adopted by the United Nations General Assembly in 1948 that consists of 30 articles recognizing an individual’s right in a free society. Article 19 of the UDHR reads: “everyone shall have the right to hold opinions without interference” and “everyone shall have the right to freedom of expression; this right shall include freedom to seek, receive and impart information and ideas of all kinds, regardless of frontiers, either orally, in writing or in print, in the form of art, or through any other media of his choice”. The article was later amended for clarification in the International Covenant on Civil and Political Rights (ICCPR) and asserts that the exercise of the free expression is not absolute. Too often, people tend to believe that their right to free speech cannot be challenged in court. It can be and should be challenged; albeit, the burden of proof is laid heavily on the plaintiff because offensive expression is not necessarily harmful. Free expression may be limited by the intent of the originator to do or incite others to do harm. Some examples of harmful expressions and limitations of speech are libel, slander, obscenity, and divulging classified information and information that may be potentially harmful to public security. Limitation on the latter two examples are important for the protection and security of not only individuals, but for the nation. America stands out among democratic nations as the model for civil liberties and free expression, and it would be a shame if she does the opposite. She cannot lose face by curtailing one of the most cherished rights of her people: yet, she must know when to stop the barrage of apparently innocuous information that may ultimately have dire consequences for the very populace whose freedom of expression she seeks to protect. Who can leash the appetites of a people who have gorged themselves on so much information that many have lost their ability to discriminate between bad and good? America is a world power for many things, but it is no secret that she is dominating the 21st century because she controls how information is distributed in the world. Power names like Facebook, Google, IBM, and Microsoft are as American as apple pie: few places on the planet have escaped their presence – if there are any. Neither can one fail to mention the ubiquitous McDonalds and Coca-Cola who indirectly appeal to their clientele through various media forms while lining their pockets overseas. In the same breath, American music and film industries surpass all that have been mentioned about other industries because these two forms have influence on various groups in any country on earth. Some people in many countries outside of the United States know more about Michael Jackson and Beyonce than what they know about celebrities in their own countries! They listen to their songs and they are affected by what comes from the mouths of these stars and the images in their videos. I was shocked to learn after visiting my native country of Jamaica two years ago, that my relatives were watching more American channels on television than I did here in the United States. That fact means that American information sells! Therefore, anybody who disseminate information to the public about the government or anything about national security, regardless of how harmless it appears, should think twice about it. Millions of people on this planet are fans of American culture, but there are many on this planet who despise the perceived values of this great country and will use what we publicize for our demise. In this violent political climate that we are living in, tempers flare, impetuous words are spoken, and revenge is sweet. However, there is a price that all will pay when the dust settles.